Railpictures.ca - James Knott Photo: A look at Stuart Street post-CN resuming operations here. 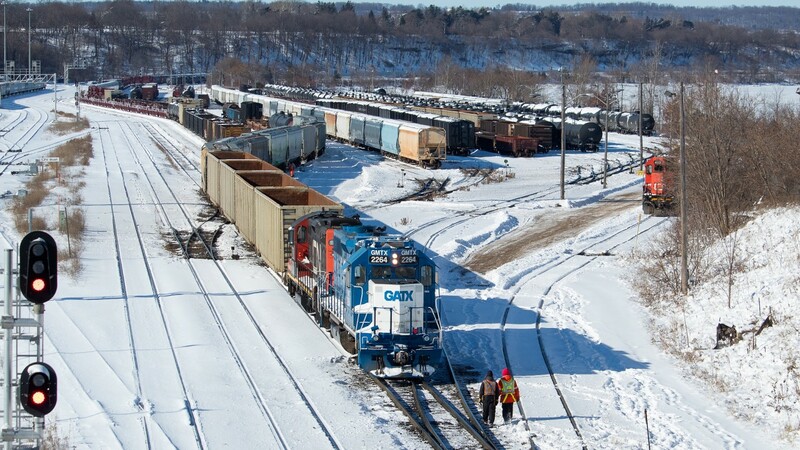 At bottom, a couple of crew members work the remote operated power outside in the bitter cold (-20C wind chill) as they switch the yard in preparation for the imminent arrival of 422 and later 331, both of which had work to do at Stuart. The switches in the yard have been cleared by crews working through the night and well into the day, after Hamilton got dumped on with over 20cm of snow. Compared with this shot in October 2018 when SOR was switching the yard and serving the industrial customers, the yard seems much more spacious now with more room on the ladder tracks, and has looked the way for much of the time that has followed the CN takeover. The long string of hoppers (where the second from the front is blue) are Nova Chemicals hoppers which have been sitting in the yard for several weeks now; something I can’t say I ever observed in the past. These hoppers are commonplace on 330/331 (for OxyVinyls east of Port Rob I believe – perhaps someone can confirm), and sometimes on 421/422 as well. | Railpictures.ca – Canadian Railway Photography – photographie ferroviaire Canadienne. Caption: A look at Stuart Street post-CN resuming operations here. At bottom, a couple of crew members work the remote operated power outside in the bitter cold (-20C wind chill) as they switch the yard in preparation for the imminent arrival of 422 and later 331, both of which had work to do at Stuart. The switches in the yard have been cleared by crews working through the night and well into the day, after Hamilton got dumped on with over 20cm of snow. Compared with this shot in October 2018 when SOR was switching the yard and serving the industrial customers, the yard seems much more spacious now with more room on the ladder tracks, and has looked the way for much of the time that has followed the CN takeover. The long string of hoppers (where the second from the front is blue) are Nova Chemicals hoppers which have been sitting in the yard for several weeks now; something I can't say I ever observed in the past. These hoppers are commonplace on 330/331 (for OxyVinyls east of Port Rob I believe - perhaps someone can confirm), and sometimes on 421/422 as well. Question: Now that they (CN) have two yards in Hamilton is Aldershot still being used or is it less busy too? -20 windchill and they are working..brrrr..but here you are foaming! Great work!! Plastic pellet producers (such as Nova) use covered hopper car as mobile warehouses. Not familiar with the storage/cost logistics. Pre CN, SOR staged Ingredion tank cars in similar fashion. I don’t think CN publishes theirs in full open public..
Let’s just say most shortlines relax some rules to encourage customers shipping by rail, as their tariffs will be far less onerous or costly. With the change to CN – it’s back to Class 1 style tariffs. One of the big differences I’m seeing in the yard is a lot fewer Columbian hoppers just sitting around (they never seemed to move all that much if at all). Could be they had some sort of storage arrangement when SOR was around? Anyways, pure speculation on my part of course. I don’t know if I can get used to this. I haven’t been back since the change over.